Nyau dancer in Waenera village. Tete province, Mozambique. 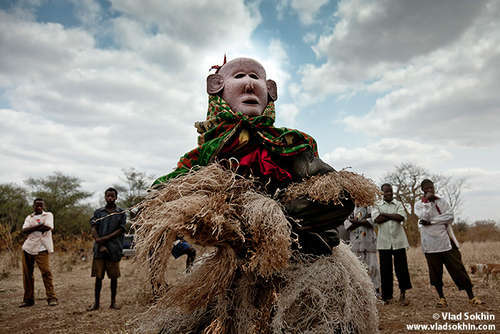 Nyau is a spiritual society of the Chewa people, who are well known because of their masquerade dances, called Gule Wamkulu, which means “The Great Dance”. They appear during public holidays, anniversaries and funerals and dance the night away. Since 2005, Nyau culture is protected by UNESCO. This Chewa tradition exists only in the Tete Province (Mozambique) and in Malawi.